Visual Echo is a self-initiated research project for my BA Thesis. 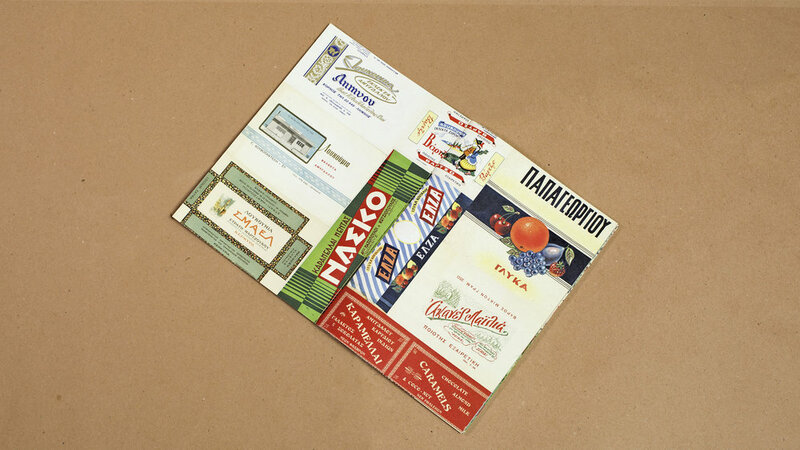 It explores possible communal visual principles within the Greek packaging design of the period 1910-1960 that could be distilled and constitute a certain typology. It is a multidisciplinary project focusing specifically on Greek Packaging Design after reviewing 200 packaging items collected by E.L.I.A. [The Hellenic Literary & Historical Archive]. The goal was to identify and codify the visual elements that are interpreted as “Greek”, and then, based on my findings, design objects. Finally the design outcomes created were a publication and a conceptual 3d puzzle, a souvenir. The research findings were presented in a publication, in the form of a Sample Book bound by a hanger, under the title “visual echo” which consists of six different issues. Each issue is my critical reflection on my research and refers to one of the six categories defined during my research process. The “sample book” analyses the semantic, illustrative and synthetic visual elements that could be understood as “Greek” features, and could constitute an initial step towards defining a certain typology. You can follow the process in my Research Blog.